What is Oxygen Help Desk? Oxygen Help Desk is a tool that gives businesses total visibility of the lifecycles of their support incidents, from tracking them since the moment customers submit their request up to the delivery of the appropriate support and resolution of their issues. Customers can also log and track the status of their service requests, encouraging transparency as well as productivity from the service agents’ end. From an administrative standpoint, Oxygen Help Desk helps in prioritizing and managing multiple tasks using built-in email management and remote support functionalities. Each enterprise is different, and might require a special Help Desk Software solution that will be designed for their business size, type of clients and staff and even particular niche they cater to. It's not wise to count on finding a perfect app that is going to work for every company regardless of their history is. It may be a good idea to read a few Oxygen Help Desk reviews first and even then you should keep in mind what the solution is intended to do for your business and your workers. Do you require a simple and straightforward service with only essential functions? Will you really make use of the complex functionalities needed by experts and large enterprises? Are there any specific tools that are especially useful for the industry you operate in? If you ask yourself these questions it is going to be much easier to find a reliable app that will match your budget. How Much Does Oxygen Help Desk Cost? Oxygen Help Desk can be acquired via standard perpetual licensing or as a SaaS via monthly subscription. Users own the software outright and can be installed in the user’s data center or in Oxygen’s own hosted data center. 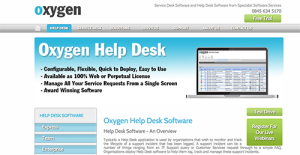 Just subscribe and pay a monthly fee to enjoy Oxygen Help Desk as a fully hosted SaaS product. We realize that when you make a decision to buy Help Desk Software it’s important not only to see how experts evaluate it in their reviews, but also to find out if the real people and companies that buy it are actually satisfied with the product. That’s why we’ve created our behavior-based Customer Satisfaction Algorithm™ that gathers customer reviews, comments and Oxygen Help Desk reviews across a wide range of social media sites. The data is then presented in an easy to digest form showing how many people had positive and negative experience with Oxygen Help Desk. With that information at hand you should be equipped to make an informed buying decision that you won’t regret. What are Oxygen Help Desk pricing details? What integrations are available for Oxygen Help Desk? If you need more information about Oxygen Help Desk or you simply have a question let us know what you need and we’ll forward your request directly to the vendor.